NAVARASI: Gujarat Dalit leader Jignesh Mevani today met Congress vice-president Rahul Gandhi and claimed that the opposition party had assured to incorporate "more than 90 per cent" of his demands in its manifesto for the upcoming state Assembly election. Stopping short of declaring an open support to the Congress, Mevani, after his meeting with the Gandhi scion, said he would ask his community members to defeat the ruling BJP in the Gujarat polls. "We listen to everyone and work after hearing their problems -- be it Jignesh, Hardik (Patidar quota stir leader Hardik Patel) or Alpesh (OBC leader Alpesh Thakor)," Rahul Gandhi said after the meeting. On the other hand, the BJP was only interested in making the people listen to its "Mann Ki Baat", the Congress MP said, taking a swipe at Prime Minister Narendra Modi's radio programme. Gandhi and Mevani had a half-an-hour long closed-door meeting at a farmhouse on the outskirts of Navsari. Mevani, a Dalit rights campaigner who shot to fame after the Una Dalit flogging incident last year, dubbed the BJP government in Gujarat as "anti-Dalit". "Since Una (the flogging incident), we have launched numerous agitations and submitted memorandums. Despite this, the thick-skinned BJP government, which is not only anti-Dalit but also anti-people, has not considered even one demand of our community. They have not even bothered to talk to us (about the demands)," Mevani told reporters after the meeting. "The people of the state will put an end to this arrogance of the BJP," he said. On the other hand, the Congress was receptive to the demands of the Dalit community, Mevani added. "We (him and other Dalit leaders) had a detailed discussion with Rahulji on our 17 demands. Rahulji not only listened to us, but said over 90 per cent of our demands were our constitutional rights. He assured us that most of the legitimate demands would be included in the Congress' manifesto (for the Gujarat polls)," he said. Asked if he would advise his community members to vote for the Congress in the upcoming Assembly polls, Mevani said, "I will ask my community not to vote for the BJP." Mevani, who has been critical of the BJP government in the state, discussed the 17 demands of his community with the Congress vice-president, who is currently on an election campaign tour of south Gujarat. The demands include an allotment of five acres of farmland to the Dalits, alternative employment for those involved in cattle-skinning and manual scavenging and the release of a probe report into an incident of firing on the community members at Thangadh in Surendranagar district in 2012. Mevani had earlier said he had no plans to join any political party. 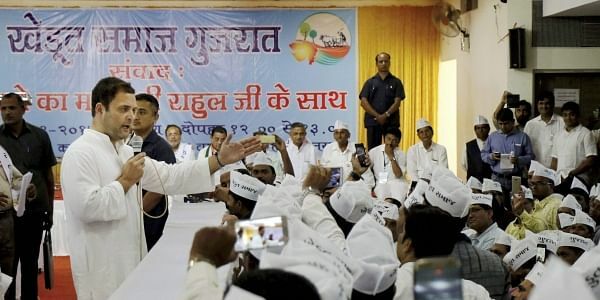 Of the three young and prominent caste or community leaders in Gujarat, Thakor has already joined the Congress, while Patel is in negotiations with the party regarding his community's demand for reservations in jobs and education. The third one, Mevani, too appears to be supportive of the opposition party, which has been out of power in Gujarat, Modi's home state, for over two decades.